The weather is changing here in the Nicoma Park, OK area and if you are considering a concrete driveway for your home this may be the perfect time to get the job done. Bill’s Custom Concrete is based in Oklahoma City, Oklahoma and has been providing residents in the OKC Metro area only the highest quality solutions to all their concrete needs for over three decades. 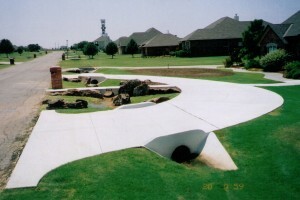 Having installed thousands of concrete driveways in this area, we are the true experts when it comes to installing a professional concrete driveway in Nicoma Park, Oklahoma. Whether you would like a custom design or possibly you want us to create a unique concrete driveway for you, our team will install a driveway that can withstand years of traffic and the heaviest of weights. 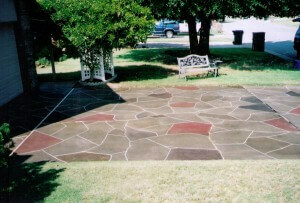 When it comes to designing a concrete driveway in Nicoma Park, OK, the team at Bill’s Custom Concrete can show you how different types of designs can transform your property. Creating a circular driveway will not only retain its form for many years to come, it also allows the homeowner to add landscaping between the driveway and the street. We have over 36 years experience working with concrete and we have a long list of referrals and reviews that show we put our customers and their needs first. We can show you instances where concrete has the ability to last 30 years or longer with the proper maintenance. Cleaning the surface occasionally with a broom and pressure washer will ensure it looks like new for many years to come. Contact Bill’s Concrete today at (405)755-3975 to create your dream concrete driveway for your Nicoma Park home. Call us to schedule a time for Bill to come to your home or commercial location to give you a quote. You will receive and honest and affordable quote that we will honor until your new concrete driveway is complete and you are completely satisfied.